Love jihad is the term that he and some other groups have used recently to describe an allegedly organized effort to seduce young non-Muslim women, eventually getting them to both marry a Muslim man and convert to Islam. The process involves much more than simply keeping young women in the community. The label “Love Jihad,” whether that threat exists or not, emphasizes a difference between Hindus and Muslims, beyond the obvious gendered dynamic of males protecting/acquiring females. Muslims become constructed as dangerous (and attractive?) jihadists preying on susceptible young women who require protection. This division further plays on the fears of some (discussed earlier in relation to the census) that demographic change threatens the majority Hindu community. The policy also challenges a different notion of community that emphasizes shared festivals and commonality between people identified as Hindu and Muslim. It is quite common for people to celebrate festivals with neighbors, friends, and coworkers who identify with another community, as is evident in this policy’s expectation that non-Hindus will participate in Garba. Therefore, this policy (and similar policies in some other areas of India) produces a different narrative and sense of community. The policy employs fear to create a sharp boundary separating these communities, asserting that people who identify as Hindus should remain wary of the motives of friendly people who identify as Muslim. The complication of distinguishing those who should be allowed to participate and those who, based on the policy, should not provides another interesting element. The current policy requires anyone admitted to have their head marked with a tilak and to be sprinkled with cow urine. The leader explains, “If a person does not apply tilak and hesitates to be sprayed with Gaumutra [cow urine], he will not be allowed to go inside.” The tilak is a common marking on the forehead (given various meanings), often received when visiting a temple or conducting devotional activities at home. Being sprayed with cow urine, however, is less common. Commonly, Hindus in India identify cow urine as one of the five gifts of the cow, and some use it as a disinfectant in cleaning homes ritually. The aversion to this act that people in other cultures might expect is not applicable. Cow urine has also reportedly been used to purify human bodies, specifically in one case to purify children identified as Dalit (outcaste). However, that specific act was controversial at the time, as not everyone accepts the practice. By putting this as proof of a Hindu identification, the policy enforces a particular notion of what it means to be Hindu, not only in terms of not having a romantic relationship with a non-Hindu, but also in terms of proper Hindu practices. 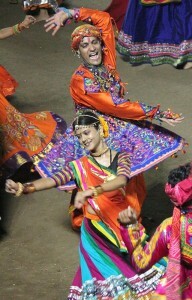 The Garba restrictions have generated complaints. In fact, while some Hindu nationalist politicians have made similar calls for restrictions on Garba admission, others identified with Hindu nationalist movements have rejected the policy. So not only do we have an effort to construct and enforce particular notions of Hindu, both through ritual practices and in opposition to Muslim, we also can see the disagreement among people who identify with Hindu nationalist ideologies. The effort to construct community often generates disagreement and challenges to that very community. Next PostNext Is Your Group Oppressed?